When I started out as a baby genealogist, I made absolutely every one of the mistakes that baby genealogists make. I accepted without question the conclusion of a published family history that my Baker line was descended from Alexander Baker of Boston2 (we’re not3), my mother’s assertion in my sister’s baby book that her great grandparents were born in Ireland and Wales4 (only if Ireland and Wales were small towns in Mississippi5) and — of course — that most lawyerly of baby-genealogist-with-law-degree mistakes. That, I am loath to confess, is the mistake of believing that the purpose of a citation in genealogy is so that others can find the record we used and duplicate our research. Now, in my own defense, that really is the purpose of a citation in law: because American law is built on precedents, we cite cases or laws or other authorities that we rely on mostly to prove that we really did quote the source correctly to say what the law is. The detail we need as genealogists isn’t where we found the information. What we need are all those small things that are often overlooked and that come back later to trip us up time and time again. Who said it? How did the person know? Is this an original document or a copy? Who prepared the copy? When? Why? Is critical information written in a different handwriting, a different ink? Duh. You have no idea (and I refuse to divulge) how long it took me to get this. And I can’t begin to say how important this point is. So I won’t. Instead, what I’ll do is point you to the Evidence Explained website, which is chock full of goodies for genealogists. 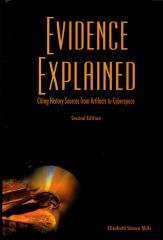 First off, there is a fabulous price on an electronic version of Evidence Explained. All 885 pages of it, for $27.95. And it’s good for three separate devices. Laptop, desktop, even an e-reader or a phone if you can figure out how to load it onto those. And if that isn’t enough, there’s also a set of forums focusing on three distinct but related aspects of analyzing evidence: Citation Issues; Evidence Analysis Issues; and Record Usage and Interpretation. All you need to do is register to use the site (you don’t have to buy a thing) and you can ask your questions and get expert help. Such a deal. Especially when the alternative is that devil lurking in those details. I’m not sure when the genealogical world and its terminologies changed. I’ve been doing this for 35 years, the last 20 as a scholarly genealogist (not a professional). I’ve just finished writing my 40th major article which will be published this month in the New England Historical and Genealogical Register. It has 136 footnotes. They all point to sources. They are precisely that. They show people where to find the sources I used in writing the article. This is the work of scholarly genealogy. Nowadays, I find that sources are no longer primary or secondary, they are original or derivative. And you have just noted that your cites need to conform to evidence standards. Color me confused. I’m still doing what I’m doing and getting published. Yet there seems to be a movement among professional genealogists who blog to change the meaning of what we as genealogists do. Very strange. I own Mills’ first book on Citations too btw. I just remember a time when you cited a source and knew that you knew what that meant. Martin, my guess is that you have been doing high-level scholarly research long enough that you do — without thinking — what Evidence Explained teaches newer genealogists to do consciously and deliberately: evaluate the value of the source. I can cite my cousin Elma’s book as a source, sure. And it’s GIGO: garbage in, garbage out. The movement that appears to baffle you is simply making sure folks like me — who don’t have your 35 years of experience and 40 published articles under our belts — know that not all sources are created equal.